What's the big deal with pronouns? The kids at school call me Rand. Not Mr. Rand. Just, Rand. With colleagues, I tend to go by Joseph or Joe. My family has given me nicknames like Joey, Joe-Joe, Josephine, Joe-Bo, and probably the most memorable, Jo-Jo the Dog-Faced Boy. At this point in my life I have racked up a lot of nicknames. And, as you can imagine, some evoke a stronger reaction than others. Names and labels can either build trust or break it down. While my Grandfather didn’t mean any harm in calling me Josephine, it was never a name I liked. At 36 years old, I can still remember the negative reaction I had each time he used it. I associated that name with girls and female characteristics that I didn’t have, or at least didn’t think I had. I was a boy. Male. Even though it was a small thing, and the way my family showed love - through picking on each other - being called Josephine was like a tiny punch to my gut. Every single time. Similar to nicknames, the pronouns we use can have a significant emotional impact on others. Pronouns are deeply connected to our identity. And our preferred pronouns, those we choose to have others use when referring to us, contain meaning, struggle, and connotation for people who feel different than what societal norms would label them. For example, just because someone identifies as male, doesn’t automatically mean they want to use he/him/his as pronouns. They may more closely identify with she/her/hers, or they/them/theirs, or something else. In a previous blog post I talked about why it’s important to create safe spaces for LGBT youth. As a follow-up, let’s explore how the seemingly simple pronoun can make our out-of-school activities, like 4-H clubs, more or less welcoming to adolescents. While it might feel uncomfortable to initiate, it is vitally important to respect the gender identity of youth. In my experience, it is more uncomfortable for adults to answer this question than it is for young people. While many youth may identify with she/her/hers or he/him/his, there might be youth who choose “they” as a singular identifying pronoun. Introducing pronouns is as simple as having youth indicate their preferences when introducing themselves to the group, or by placing pronouns on name tags. Another strategy might be to introduce the request for preferred pronouns at a meeting with adults or youth leaders first, and training them on the importance of using this strategy with other youth. While trans youth most commonly indicate a pronoun different from the one you would assign, respecting youth’s identities helps educate all youth, and indicates that you value their self identification. Additionally, it helps them understand they are in a supportive and safe environment, and that you are a caring adult they can approach with questions and for advice. We all screw up pronouns from time to time. In those situations, it’s important to apologize and move on using the correct ones. If you have forgotten someone’s preference, just ask them to remind you. “Tell me again what pronouns you prefer?” shows that, even if not perfect, you care and want to be trusted by the young people in your group. Don’t just ask at one meeting or event and assume you have the right answer forever. During adolescence, youth are exploring their identities (Erikson, 1980*). Just like they might change their hair color, get a piercing, a tattoo, migrate through different friend groups or change clothing styles, they might decide to use different pronouns. It’s also important to note that your reaction to a new pronoun is important. Think about a time when you engaged in a major physical appearance change (piercing, hair color/cut), how did people's reactions affect you? By incorporating a strategy for honoring preferred pronouns into your routine, it becomes normal, and helps youth know that your group is a safe space where they are free to be themselves. It’s hard to believe that something so small could mean so much. However, repeated affirmation of one’s identity through routines, safe spaces, and supportive relationships has lasting effects on youth exploring their identities. Building these strategies into out of school time programs, like 4-H, helps us move beyond just saying we are open to all youth, and through actions, helps them feel like we can be a positive safe space for youth development. What other simple actions can youth workers use to help LGBT youth feel safe and welcome? * Erikson EH. Identity and the life cycle. New York: Norton; 1946/1980. Ego development and historical change; pp. 17–50. Thanks Laura! I'd love to hear your insight regarding your experiences in 4-H and other youth development settings! This is wonderfully put Joe. There is so much importance in asking the youth we work with what they would like to be called and to make sure we honor their requests. Each child deserves to have their own identity honored. By doing this, we create trust and strengthen the relationships we can and will form with them. Abby, you're on the front lines! What you do is so important! I'm proud of the good work you do, and the ways you work to include all youth. Have you had any experiences with youth requesting pronouns? What was that experience like? Thank you, Joe. So glad to have your words of wisdom and perspective in this forum. A note about one of the resources you listed - we've now created a much shorter summary of the Children's Mental Health eReview issue on the Mental Health of Transgender Youth - appropriate for parents and teachers and now posted at: http://www.extension.umn.edu/family/cyfc/our-programs/ereview/docs/transgender-youth-summary.pdf. Thank you, Cari! Thank you for sharing the summary! This information is vital to our work in Youth Development! This is great Joe! I appreciate you sharing your personal story about your experiences with nicknames as a child (some positive and some not). This is a great reminder of how important pronouns are, even if we don't think about them some times. Some actions that youth workers could take to help LGBT youth feel safe and welcome include not tolerating bullying in any program, modeling appropriate language, behaviors, interactions, etc., responding to negative behaviors that might occur, and being aware of and planning for underlying gender roles in activities. I thin kyour point about underlying gender roles in activities is a super important one. An excerpt I didn't include in this blog, but will next time, talked about how we often engage in gender based activities like lock in's where girls have spa nights and boys have video game nights. Why not combine? You're so right that we need to model inclusive practices in order to create welcoming environments. Language use and re-thinking the gender roles is something I am working on personally and encouraging the youth leaders I work with to try using as well. Some things that I am working to include in my practice - using spouse or partner instead of husband/wife or girlfriend/boyfriend; referring to moms and dads as parents, parents/guardians, and/or "adults you live with"; finding different ways to split groups - instead of "guys over here, girls over here"; when welcoming youth to a space, identify a gender-neutral bathroom every time. These are great, easy, and super helpful ways of creating a safe space! I think about the parent one all the time lately given the number of homeless and foster youth with whom I work. These strategies really transcend sexual orientation and gender identity, and help create safe spaces for ALL kids from ALL walks of life. Thanks for the wise words of wisdom Joe, and reminding us that "simple" things matter a lot, and that if we are serious about being inclusive and creating safe spaces, we need to take actions that matter for youth. A colleague in NY 4-H has a 4-H Safe Space graphic on her email signature, and the state has created a guide about their commitment to creating Safe Spaces. Check it out here: http://4hstaff.cce.cornell.edu/system/files/using_the_nys_4h_safe_spaces_logo_0.pdf I think it is something MN 4-H needs to consider. NY state 4-H youth were highly involved in this effort. Thank you for this resource Anne! I already shared it with our Communications team. Unfortunately, we can't use the logo here, but can use the tool! I also think adding our own pronouns to our email signatures is a small way we can model and create safe spaces. Great topic and article Joe! As an adult I have made the mistake of using the wrong pronoun to address individuals and it was a valuable lesson. I appreciate your ideas in helping all of us avoid using labels that others may find offensive or unwelcoming. In the future when working with youth audiences I will use your example of having others indicate their preferences when introducing themselves. It is a simple and effective way to get to know others and provide the welcoming environment that we seek to provide in 4-H experiences. I have made this mistake more than once! Just make sure you acknowledge, apologize, and move on. Making a bigger deal than necessary can make things awkward. Normalizing pronouns by asking during introductions is a great way to insert the practice in a non-threatening way. It can be awkward the first time, but becomes routine. Joe, thank you for sharing this incredibly clear and approachable introduction to what can be a complex topic. When we model on a consistent basis having people introduce themselves with their pronouns, it helps to normalize the fact that pronouns are not just a given. Even by asking the question, it introduces the perspective that people might have an answer other than the "obvious" one. I also include my pronouns on my email signature both so people know, and to let people know that I am someone who would be fine if someone uses another pronoun. It is a tiny little thing, but I hope it sends a message of inclusion to other people. What are some additional ways that we can help to put out these little flags to say "you are welcome and wanted here"? Just updated my signature - thanks for the modeling! I love when I see pronouns in email signatures! I have them in mine as well. This is such a small and easy way to let folks know that you are supportive and inclusive, and a person they can go to for support! Kathryn and Heidi, thank you for the continued work and support you do to include all youth!! We use pre-printed name tags at our events that allow people to indicate their pronoun preference. A great way to start the conversation. This is such a cool idea! Great strategy Cari! Thank you! When working in systems like mine, I also ask for a preferred name in registration materials. Some youth (and volunteers), may no longer identify with their birth/legal name that is included when they are enrolled in programs or when we conduct background checks. This is so timely! I have a student at school who is required to be referred to with their given legal name in print/registrations etc, but is allowed to go by their preferred name otherwise. While a nice accommodation, it still feels like it falls short and that there should be a policy or process for these kids. Especially if a parent has made the decision to not allow them to go by the name they prefer. Thanks for your insight Jacquie! I am so grateful that I work for an organization that continues to learn together how to be as supportive of all young as possible and allow young people to teach us along the way. Still struggling to remember the pronouns ze/hir/hir for some people I know who have recently made their preference known. As we move to greater and greater understanding of belonging, this conversation means more and more to me personally. Another thought - our sign-in sheets ask people to indicate their gender as male or female. Time for updating those, folks? YES! I think we have done this on some forms in our Urban programming, but it really needs to happen across the board! This might also be a question for evaluation folks depending on what is required for federal reporting, and even more reason to keep pushing for inclusion! Agreed! I've been working to remove this question on forms whenever possible - do we really need it in all the places we think we do? With 4-H, I know there are some federal reporting requirements that have thus far prevented us from abandoning it completely, but there are so many places we ask it that we really do not need it. Thank you for this blog. I know in outstate MN the LGBT community and especially youth struggle with identity. I hear this anecdotally and through youth that have left the region to go to other communities perceived more welcoming. I think it is up to both the club leaders and youth leaders to create a more welcoming environment for all and I value how a simple pronoun can assist in creating that welcoming environment. Thank you for your insights Joshua. I can imagine what its like up in northwest. Likely, its similar to Becker, where I live. There are so many small things we can do in our communities to create safe spaces. 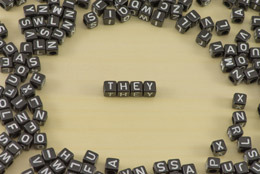 Pronouns are a great place to start, getting connected to GSA's and helping promote their work is another. Equipping our staff and club leaders with tools and modeling behaviors is also vital to our success in creating safe spaces within our 4-H programming. Yes, and - We found tremendous interest and support as we brought our Extension "Meeting the Needs of Transgender Youth" to communities around Minnesota during 2017 - Andover, Morris, St. Cloud, Grand Rapids, Minneapolis, Bemidji, and Rochester (see detail at: http://www.extension.umn.edu/family/cyfc/our-programs/transgender-toolkit/). I think we'll continue to find partners and assistance in doing this important work. This was such a great event for communities! I hope that something similar can happen again. I attended the event in the Twin Cities and found it super informative, challenging (in good ways), and vital to our mission of serving all youth in Minnesota. Nicely done, and has now connected me to other individuals I can share best practices with. I have the same question as Heidi - We can add a they/them option on sign in sheets, name tags, etc. but how does this translate when doing group reporting or audience reached reporting? I know this article is about conversation and creating safe spaces, and being inclusive and respectful, building support, and I love it. I love that we bring these issues front and center and find voices to share experiences and lessons, it is amazing. Building this awareness in youth, and keeping in mind that identity can be fluid, and something we should always honor is so valuable. But...I always wonder about the reporting side because so much of our work gets distilled into numbers and percentages. If I have a sign in sheet with 3 options and my reporting form has 2, how do I handle that? It is like forgetting this conversation ever happened because at the end of the day they just want to know how many males and how many females. I hope that we can develop a way to report these numbers correctly as well! Thanks for looking at these topics holistically. This one is really hard because typically a program will drive the direction of data systems. In this case, however, we are often bound to data systems from our funding agencies that are not changing quickly enough. In the case of 4-H, we do have counties around the state that change the gender categories on enrollment forms. However, like you noted, this then is missing data in reporting because we don't have a system that support more than 2 gender variables. What I would encourage programs to think about is what do they need most for their particular program- having enrollment forms be welcoming to all youth or data accuracy? In the data world, we know that there is always data error in our reporting, so I'm willing to miss out on some youth having complete gender data if it means they are welcomed into the program. Keep in mind they will still show up in other variables that we count such as number of participants or race data.